A campus with such a dynamic student body undeniably brings diverse styles of dress along with it. Some students dress to the nines for class, and some practically live in “athleisure” wear. Some sport a preppy style, while others prefer grunge or bohemian. Name a trend and you can probably find it on this campus. 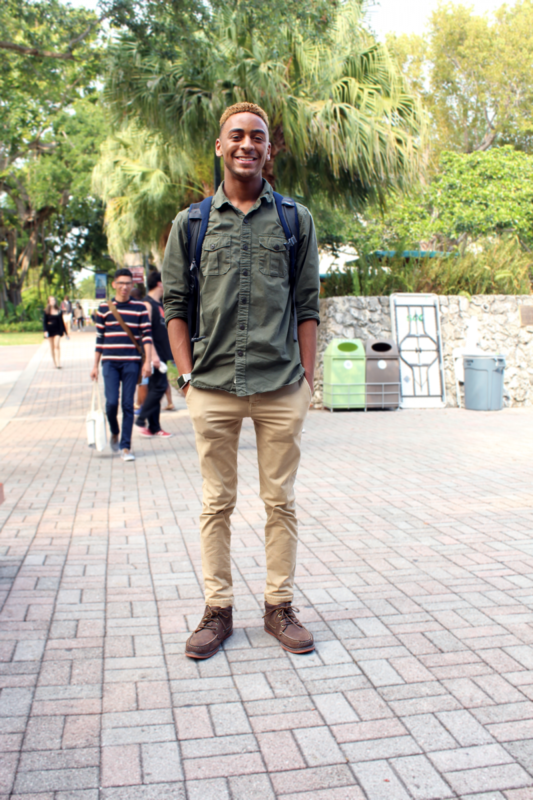 Check out these ten students showing off their signature styles. Gone are the days when a stylish outfit meant breaking the bank. Local thrift stores are full of hidden treasures, ones that will have you looking like a million bucks for less than you ever imagined. Gonzalez got her top from a thrift store in Wynwood, her jeans from a shop in Rome and her bracelets from her home country of Venezuela. Professional clothes don’t have to be boring. 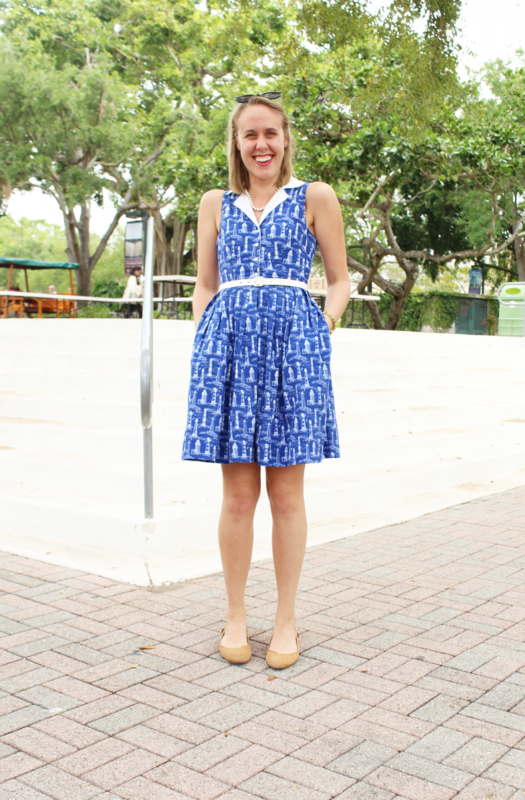 The skyline print and bright colors of this ModCloth dress give a modern, fun flair to an otherwise classic outfit. To top it off, it has hidden pockets – who doesn’t love pockets? Adding fun patches, embellishments and pins to grungy distressed denim is an easy way to make a major statement. 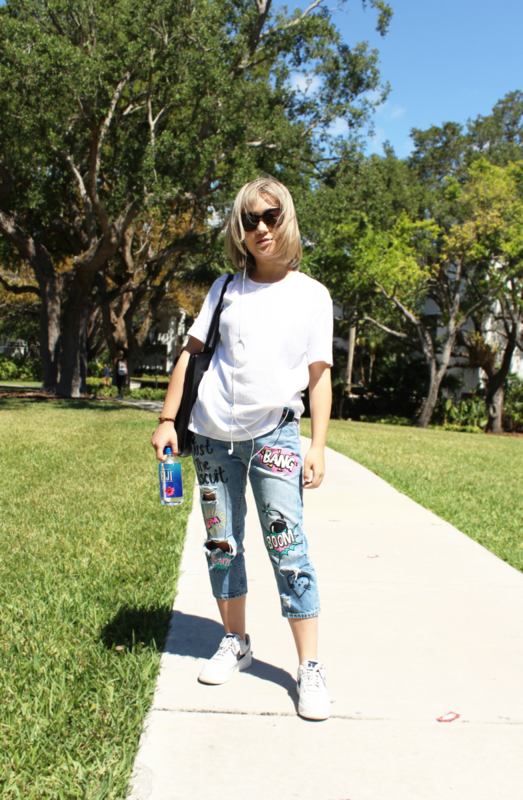 Bao got her jeans in China, but you can recreate the look with some old denim, sandpaper (for distressing) and some patches from a craft store. Remember that old rule, “No white before Memorial Day or after Labor Day?” It’s exactly that: old. Pairing a white statement item with other bright colors creates an outfit sure to bring smiles and catch a few glances. Not to mention it’s a signature Miami look when the weather gets hot. Overalls have made a big comeback in the past few years. Personalizing a pair (like this cute overall dress from Forever 21) with a graphic undershirt (hers is from TJ Maxx) and your favorite sneakers transforms this ’90s fad into a trendy outfit full of personality. 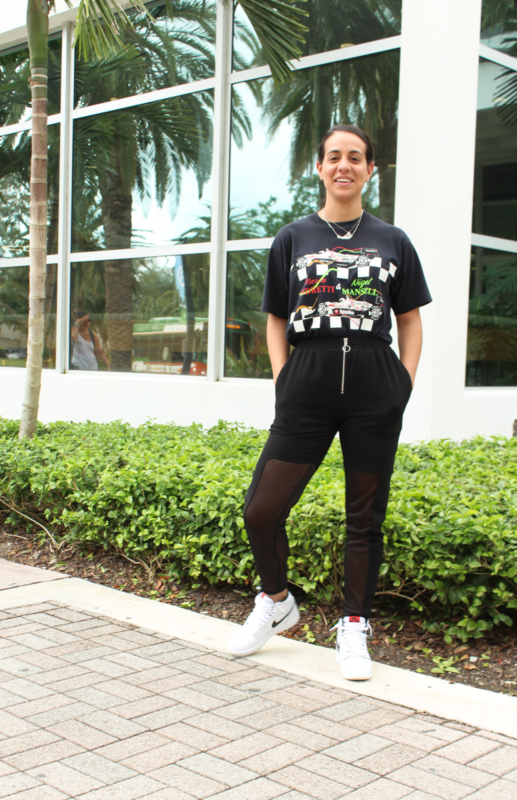 Delgado combined two trends – mesh (Maniere Devoir pants) and vintage (racing tee) – to create an edgy outfit that stands out on UM’s fashionable campus. All that’s missing is a colorful, iconic Wynwood street-art backdrop to make for the ultimate Instagram photo. Don’t feel like you have to wear yellow, orange and pastels for spring. Earth tones are an understated way to stay well-dressed and in style all year round. 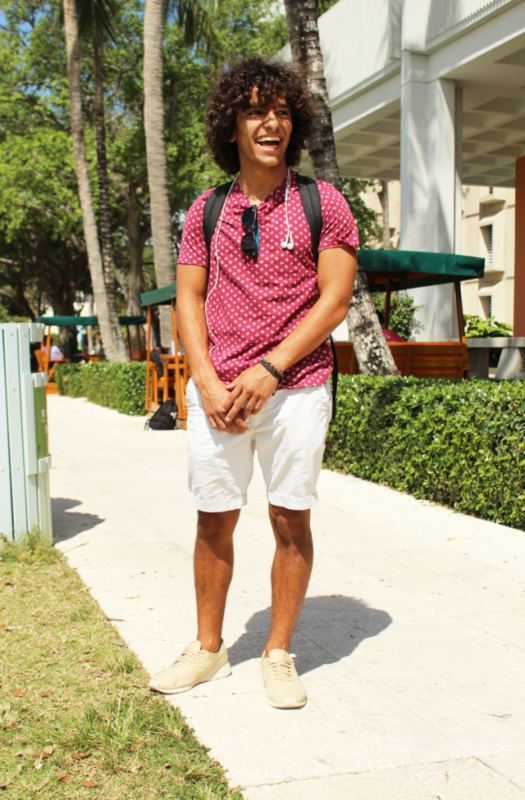 Bolden pairs his American Eagle button down with ASOS jeans and Sperry shoes. This time of year brings warmth and growth, so why not wear an outfit to match? Bright yellow screams positivity, while at the same time making an eye-catching, fashion-forward statement. All items from Urban Outfitters. Spring is no longer just for bright colors and flowing fabrics. Shedding the layers and pairing your favorite winter trends (like these Zara velvet shoes) with a cool pair of jeans (Brandy Melville) and sunglasses is the perfect way to transition those pieces into a new season. Miami is hot enough as is – no need to be uncomfortable. Pairing a flowy dress (Brandy Melville) with sandals (Steve Madden) will create a low-key, boho look that’s sure to keep you feeling and looking cool.